In a saucepan, dissolve brown sugar, apple juice, oil, soy sauce, ginger, salt and ground pepper. Boil. Add dissolve cornstarch in water. Stir until sauce is thick. 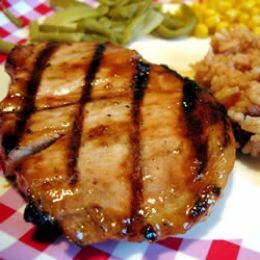 Place pork chops on lightly-oiled grill grate. Cook meat for 10 to 12 minutes on each side. Turning to avoid burning. Brush with sauce over pork chops just before removing from grill. Serve hot with remaining sauce.